When you build a major road, people build along it to take advantage of the opportunities it brings. When that major road stands the test of time, as the National Road has in Indiana, you find some great old architecture along it. 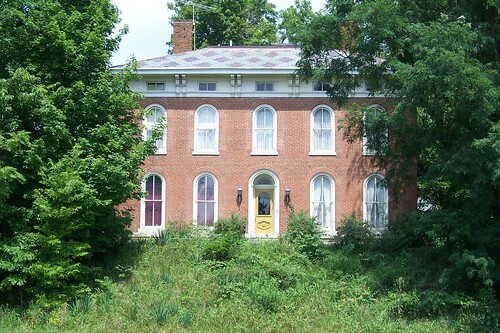 This home, for example, stands along the road in Plainfield. I’m no architectural scholar, but this looks like an Italianate to me, and so I’d guess it was built around 1860. I’m guessing this might be a Colonial Revival house, but I can’t guess when it was built. It’s also in Plainfield. This 1872 Italinate (which I know only because I looked it up) is known as Rising Hall. It stands just inside the Hendricks-Putnam county line. A man named McHaffie built it; he is best known for providing more mules than anybody for the Union Army during the Civil War. A bit farther west in Putnam County stands this home, about which I know nothing. But it sure stands proudly along the road. I know a bit more about this house, which stands on the north side of the road just east of Harmony in Clay County. 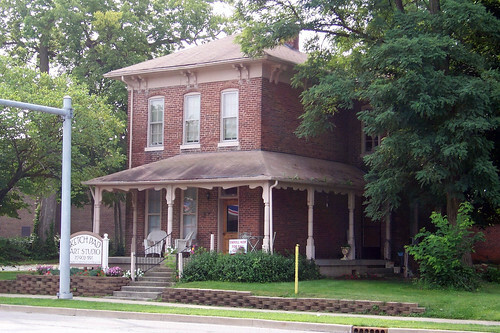 It was built by a doctor named McKinley in 1872 and today is the McKinley Bed and Breakfast. It is quite lovely inside. The home’s front yard was not always a jungle. When the house was built, the road was a narrow path much farther from the front door and was level with the front stoop. The house sits atop a rise, and as the road was widened and leveled over time, the rise was cut out. George Stewart, who photographed scenes along US 40 from coast to coast for his 1953 book US 40: Cross Section of the United States of America, also captured this house. Here’s his photograph, which shows the cut’s severity and how it eliminated the house’s front yard. Isn’t it remarkable how, excepting the shutters present then but not now, the house looks as though it has merely glided forward through time, as if in stasis? Yet when Thomas and Geraldine Vale retraced Stewart’s steps for their 1983 book US 40 Today: Thirty Years of Landscape Change in America, they found the house abandoned and rotting, obscured by overgrown trees and shrubs. This house has been restored to its present condition. It makes you wonder what the other houses’ stories are. 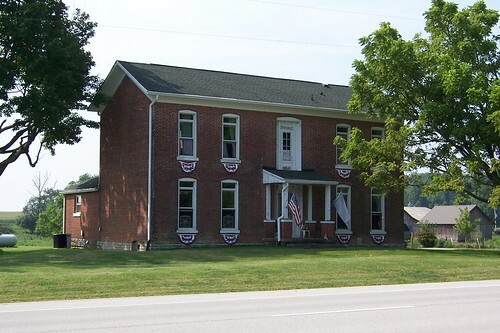 Indiana’s Michigan Road, built in the 1830s, has its share of old homes. See the Fairmount House, the Boardman House, and the Corbin House. I’ve always been wowed by Rising Hall-such a great presence. It won’t be long before your an architectural scholar. I’ve had a good teacher! I like old houses and buildings, so clearly I enjoyed your photos and commentary. Thanks. Interesting that it still has a TV antenna. It looks like a photo from the 1970s. My understanding is that the front door never gets used — guests follow a driveway to a rear entrance. The first step off the front stoop would be a killer, anyway! The first picture in the post is a house that sits along the highway in front of the Western Yearly Meeting building in Plainfield. 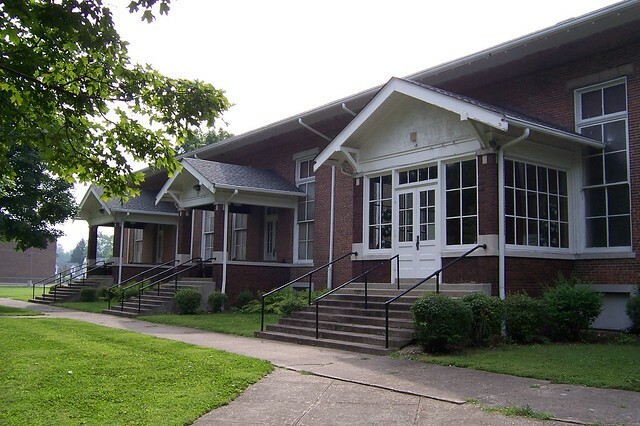 The Yearly Meeting building was erected in 1857 as the location for the annual meetings of Friends (Quakers) in Western Indiana. The house in your picture was built in 1872 as a place to store books and records. 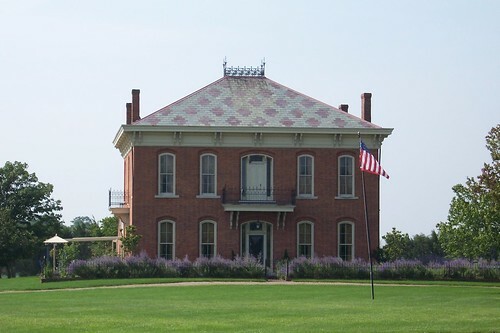 It also came to be used as a residence for the Yearly Meeting Superintendent. I don’t know when the Yearly Meeting sold it.